Dessert. It’s the crowning glory to a meal. Who doesn’t love something sweet after dinner? But sugar-laden, high-fat desserts can leave us feeling overfull and uncomfortable because they’re not what our bodies need. Often all I really want is a tiny taste. Shot glass desserts to the rescue! So let’s talk about this Caramel Almond Crunch Ice Cream. Made with wholesome ingredients and loaded with the healthy benefits of almonds, it will satisfy anyone’s craving for something sweet, even mine! Listen to this ingredient list: bananas, dates, almond milk, almonds, maple syrup, cinnamon . . . no dairy, no refined sugar . 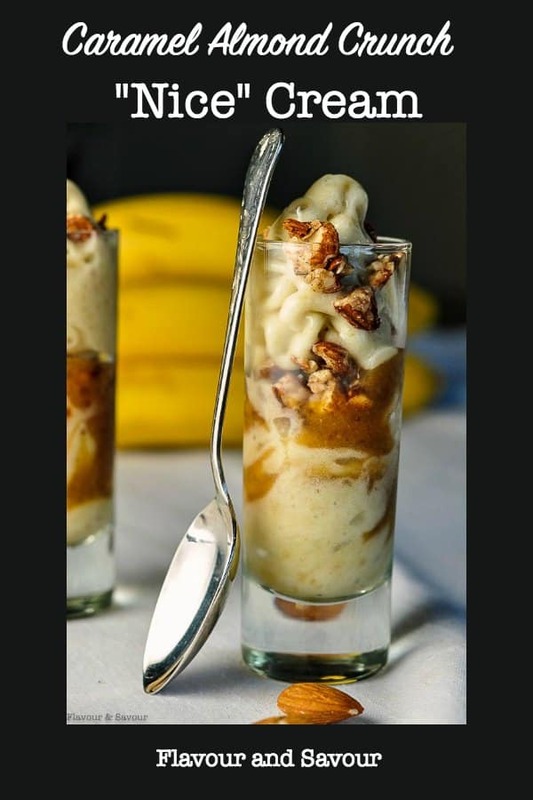 . . just sweet, natural goodness layered in a cute li’l glass. Almonds are a powerhouse of good nutrition. Besides being an excellent source of protein, they have heart-healthy “good fats” which may help to lower cholesterol. Incorporating almonds as a snack food into your diet can help to prevent spikes in your blood sugar. 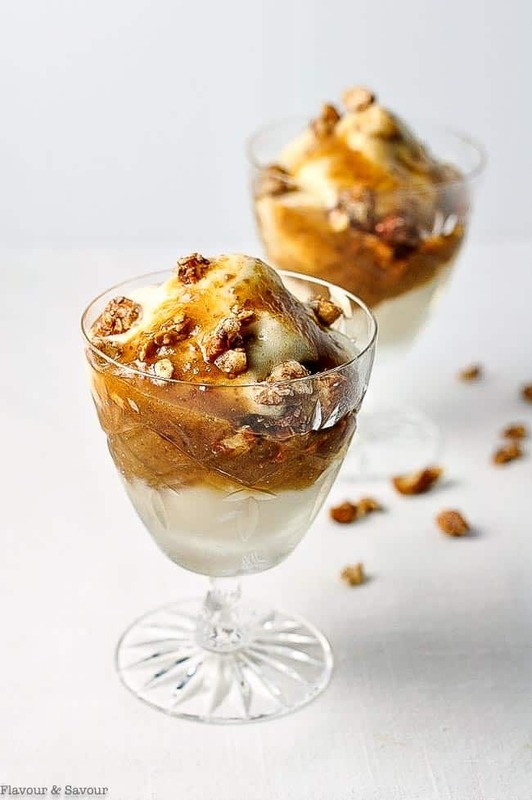 Or just get busy and make this Caramel Almond Crunch Ice Cream right now and reap the benefits instead of just reading about them! 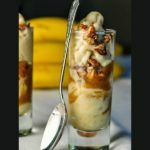 Start by preparing the topping, make the caramel sauce next, and then all you have to do before dessert time is whir some frozen bananas in your high-speed blender. I have the topping and the caramel sauce pre-made and tucked away in my fridge so I can whip up this healthy snack at a moment’s notice instead of reaching for something sugary. Make it. You won’t be disappointed. 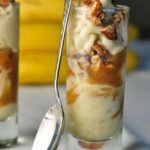 Frozen banana "ice cream" layered with an almond milk caramel sauce sweetened with dates and maple syrup and topped off with crunchy toasted cinnamon almonds makes this guilt-free shot glass dessert. Peel and slice bananas. Spread out in a single layer on a baking sheet and freeze until very firm, at least 6 hours or preferably overnight. First, prepare the crunchy almond topping. Preheat oven to 325F. 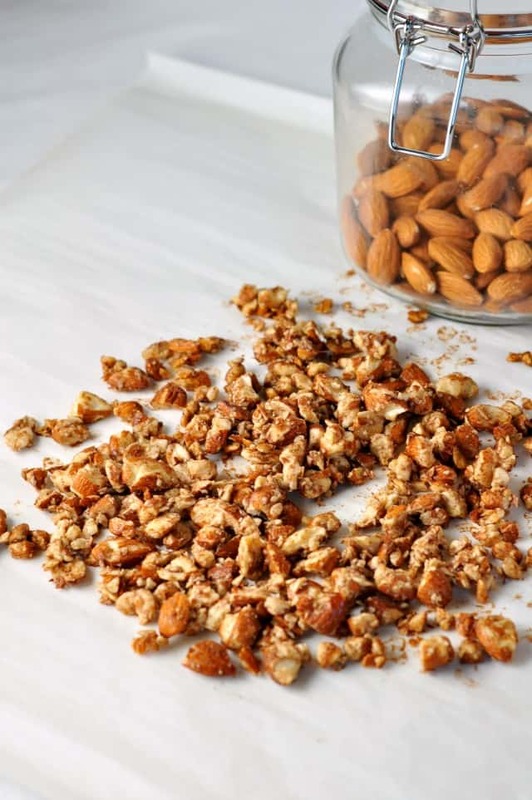 Toss the chopped almonds with maple syrup, cinnamon and sea salt in a small bowl. Spread out on a lined baking sheet and toast until caramelized, about 10 minutes. Remove from oven and set aside to cool. Next, prepare the caramel sauce. Put the dates in a food processor and pulse until chopped. With machine running, add the vanilla and sea salt. Pour in the almond milk and maple syrup and process until smooth. Transfer to a jar and refrigerate. 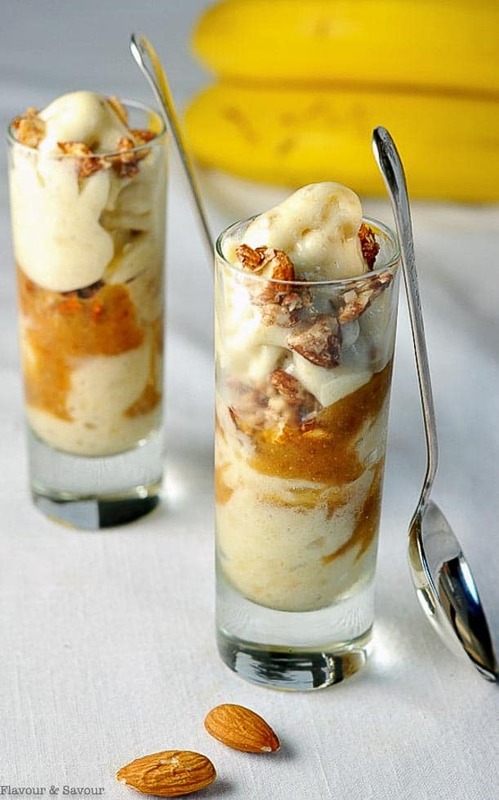 Just before serving, blend the frozen banana slices in a high-speed blender, just until they are smooth and creamy. Be careful not to over process, as the friction from the blender will melt the ice cream. 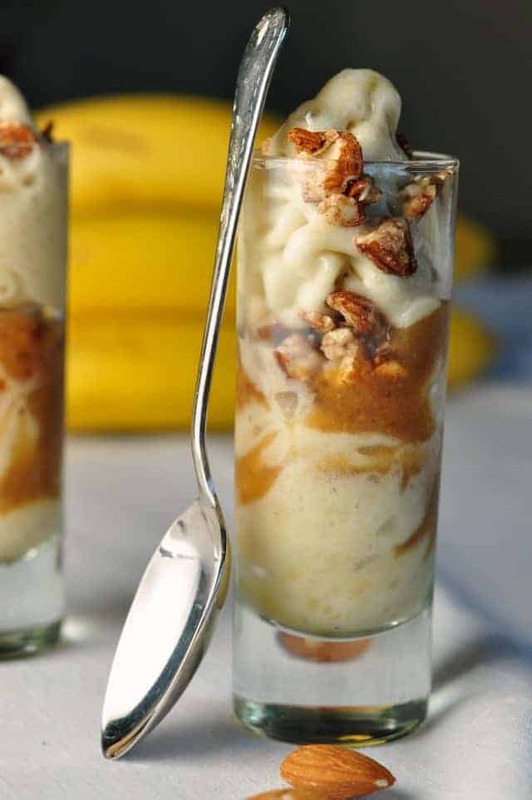 Layer the banana ice, caramel sauce and crunchy cinnamon almonds in shot glass or parfait glasses and serve immediately. This post was inspired by a recipe I discovered on Swoonfood.com I’ve adapted it slightly. It was so easy to make and absolutely delicious. I did not have to freeze the banana slices for more than an hour or two and it made up incredible ice cream. Thank you!! Wow! You’re quick! Isn’t it good?? I was thinking of making a pie for dessert. Then, I saw your entry and once I realized I had all of the ingredients, I was on it. Why ever buy ice cream again? I could not tell the difference between bought ice cream and the frozen bananas. It was incredible. Dear friend, blog on….. I just added coconut whipped cream to this goodness. Yuuuummmm! Caramel . . . nuts . . . ice cream . . . and now coconut whipped cream. Sigh. Life is good when there is dessert. Thanks for letting me know how much you and your kids liked this! Now you have one more recipe for eating “clean!” I love this one because it is so easy and I can whip it up for a last-minute treat. Happy cooking! I can’t wait to make this. My mouth is watering lol. Is there anything I can replace the dates with as I’m out of them and I want to make it now please. Sorry–this homemade “caramel sauce” really relies on dates for sweetness and texture. I don’t think there is a good substitute in this case. I bought some dates. I’m making this today can’t wait. Mouth is watering just thinking about it. I have one more question. Is the Carmel sauce supposed to be thick or thin.? Mine came out this kind of runny. I may have used a little to much milk. I did messier it in a liquid measure cup. I also could not get the medjool dates so I used sun sweet pitted dates.